Big George Brock turned 80 last year, and has been playing the blues for nearly 60 years. The Grenada, Mississippi native spent his teen years in Clarksdale before moving to St. Louis in the �50s, where he boxed, played the blues and owned several blues clubs in the �60s and �70s. 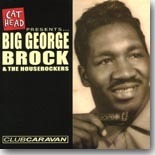 Eventually, he and his band, the Houserockers, served as house band for Climmie�s Western Inn in St. Louis for a dozen years, which is where future Cat Head Records chief Roger Stolle first heard him. When Stolle moved to Clarksdale and opened his Cat Head store, he booked Brock for the Grand Opening after he found out Brock was from there, then helped him book a few more shows. Soon after, Brock mentioned to Stolle that he was interested in recording an album, so Stolle took a chance and took Brock and the Houserockers (guitarist Riley Coatie�s family band) to Jimbo Mathus� Delta Recording Studio for a 3 � hour recording session. The result of that session was Club Caravan, named after one of Brock�s old St. Louis clubs. If you like your blues played the old fashioned way, Club Caravan is the disc for you. Coatie taught his children (Tekora � bass, Latasha � keyboards, and Riley, Jr. � drums) to play the blues like they used to in the �50s and �60s, which is right up Brock�s alley. They cover Muddy Waters (�Louisiana Blues�), Sonny Boy Williamson (�Nine Below Zero�), Jimmy Reed (�Honest I Do�), and Howlin� Wolf (�Little Baby�) and they�re so good that you would never know this music was recorded in 2005. All you have to do is hear Coatie, Jr.�s grunts as he hammers the drums on �Louisiana Blues� to realize that this family not only play the blues, but they feel them, too. Since Club Caravan�s release, Cat Head has issued two excellent follow-up, 2006�s Round Two (which featured Hubert Sumlin on several tracks) and 2007�s Live At Seventy-Five (recorded at Ground Zero Blues Club in Clarksdale), plus the aforementioned DVD, Hard Times. Brock also appeared in Stolle and Jeff Konkel�s 2012 documentary, We Juke Up In Here!, and also released a 2007 disc of cover tunes for APO, called Heavyweight Blues. Big George Brock is the real deal as far as old school blues go, and Club Caravan offers some of the best of that variety in recent memory.